This is a guest post by Saleem Yaqub (@SaleemYaqub on Twitter) about Web Traffic Control that may generate quite the controversy within the blogging community because many bloggers are adamantly opposed to paid posts – often because they are afraid of being penalized by the 800 pound search engine gorilla. A recent guest post on MyBlogGuest and the comments in it explain why some feel bloggers should not Charge for Publishing Guest Posts on their blogs – ever! Bloggers in the blogging tips, social media and other niches may not be aware that many product review bloggers have long either accepted products to review or charged to publish posts that link to a business offering products or services. Personally, I feel that a blogger is either ethical or not and if they are ethical they will not cease to live by their own moral compass because they receive products to review or payment for publishing posts. Not being compensated does not make someone ethical. Their ethical standards dictate their actions. Guest blogging is more popular than ever since it offers a win-win situation for everyone involved. The person writing the guest post (business owner or advertiser) gets great exposure along with backlinks on targeted blogs, while the blog owner gets fresh content to grow their blog for free. Search engines prefer sites that are regularly updated, so adding content on a regular basis can help to boost overall traffic and thus sales from any affiliate programs that you participate in. On top of that, accepting guest posts can save you time and money since quality content production is no easy affair. The difficult part of setting this type of arrangement up in the first place is finding the right content partners and handling all of the admin involved. And how do you get a regular enough supply of guest posts to turn this into a growth strategy rather than the odd post here and there? 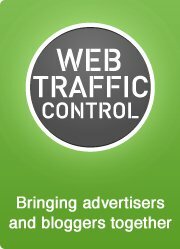 This is where Web Traffic Control comes in, making it much easier and more efficient for all parties involved. To make matters even more interesting, it presents an excellent opportunity for blog owners to earn some extra cash too. Web Traffic Control is the world’s first guest blogging network to combine manual moderation with automated distribution. This means there’s no need to go out looking for content partners, because the network does that for you automatically. You sign up and add your blog into the network. Whilst doing so you get to choose what types of content you want to accept from a	comprehensive list of categories (much like you’d find on a directory). That way you can easily keep your blog on theme. Advertisers (or the guest post writers) then come along and submit guest posts for distribution on the network. WTC’s moderators manually check each post to make sure that its original, good quality and family friendly. This point is important, since it means you won’t receive junk content and they will filter out the rubbish for you. You then log in to your control panel where you will see a list of pending posts that the system wants you to publish. Simply press accept or decline and that’s it! If you press accept, the post is automatically published onto your blog (they ask you to create a separate WordPress user just for WTC and supply the login detail during the signup process). It looks like WTC takes quality very seriously, since there are two layers of moderation, first they check each post, and then you do. YOU get to approve or decline each post. But you have to do it within THREE DAYS or it auto-approves. The network was developed by UareL, (a digital marketing agency) in response to their frustration with finding regular and reliable sources of exposure, traffic and backlinks for their clients who include a number of well known brands. The best part of this is that you make money for each post that you accept. Yes, you earn money when someone else provides you with free content! They promise up to $750 per month in earnings, based on a rate of $15 per article and a maximum of 50 posts per month. This is a flat rate, regardless of the size of your site. In this way, Web Traffic Control could prove to be a big money-maker for smaller blogs. If you have multiple blogs, you can multiply that $750 by the number of sites you have. Even though there is a page for advertisers that side of Web Traffic Control isn’t quite ready just yet. They’re working on building up a network of bloggers first, ensuring that there are enough places for all these guest posts to go. They also ask for your help to grow the network by spreading the word on social networks and perhaps writing a post on your blog. The sign up and setup process is very easy and takes less than 5 minutes. First you give the URL to the blog you’d like to add to the network, then you create a separate WordPress user on that blog for Web Traffic Control to use. You’ll also need to make sure that your blog meets their entry requirements. After that, you choose the categories that are most relevant to your blog. The service allows for up to ten categories. This is important, because you want to make sure that the guest blog posts are related to your core content. Normally, Web Traffic Control says that it charges a one off $50 fee for bloggers to join the network, but the $50 fee is being waived for the first 1000 users. The main entry requirements are that your blog needs to be good quality with a minimum Page Rank of 2. This helps to guarantee quality links for the advertisers, and it also prevents people from making dozens of new blogs just to join WTC. Note that they review each blog manually, so don’t waste your time by attempting to add brand new or low quality blogs into the network. This is a new and innovative take on guest blogging and we think it’s going to be a huge success. So, what do YOU think? Are you willing to see what kind of posts businesses might be willing to pay to have published and evaluate them on their own merits – or are you in the ‘money for blogging is inherently dirty’ camp? Join us for what is likely to be a very lively discussion in the comments. Nice post more knowledgeable and well-experienced tips and tricks mentioned above to have more ranking in SERP’s result. I am also doing guest posting on high authority blog list of 100 and got a lot of benefits of creating links and promoting my blogs and sits continuously. glad to see you post a lot of new tips and tricks which really appreciated and admirable to be considered for ranking point of view also idea to give service as guest posting for clients to earn more money for carrier building. david smith would love you to read ..Happy New Year 2019 Wishes, Greetings And Quotes In China For Friends Family And Loved One! So interesting post ..! the all points are best and informative, the all points are very helpful , thank you for sharing the blog. It’s great to know that such services exist. I can’t wait to start receiving guest posts directly on my blog. thanks for sharing. MUCH huffing and puffing on the east coast of America at the news that a child issued instructions from the air-traffic-control tower at JFK airport. The story is told in detail but the essence is that a boy who seems to have been accompanying a parent to work during a school holiday delivered five transmissions to departing aircraft. Had they heard this sort of thing before?Fox News anchor opened the related segment with the phrase Air-traffic control at a busy New York airport being run by a child? Inasmuch as that is a question the answer is no. Wow, another money-making gig to look upon. Thanks for sharing. It seems like a great idea, but I’m afraid of the big G not liking it so much…the guest postis published in only one blog?. If it isn’t, how do you manage the dup content issue? I would rather sell ad space than let guest posters post all kinds of who knows what. I used to let one of my sites non wordpress allow all instant blog posts. It didn’t take long for me to change that. Way to much spam and junk. I wouldn’t even let people pay me to allow that on my sites. I would rather sell a 125×125 for a nominal fee than most guest posts. Plus I usually don’t have time to weed through all the junk. But it’s a thought anyway. I did a showcase of this service too but after being with them for over a month I have yet to see a single guest post. Just waiting to see if it catches on. IZEA did a similar thing with Sponzai that didn’t do well. We will be targeting our Advertisers based on their website, seo position, online marketing budgets and other factors. Although i do like this type of self actualization and people with a common interest working around the powers that be and making things happen but what would concern me is that one thing Google does specialize in is finding ‘networks’. At long last, sounds interesting for those who have been in the game for a while now and a $750 sign of hope for newbies as soon as their blog gets a year old. About ethics: I think this is something that each individual should decide. I have met enough people to realize that two otherwise honest and decent people might have completely opposite view when it comes to ethics about something specific. So I say, each woman to herself. About the system: I think it is brilliant. 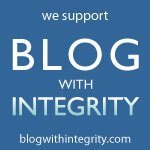 The way it is structured, the blog owner gets to decide which of the posts are “worthy” of his blog. Nothing could be fairer than this (to the blog owner, of course). Well, I’m going to give it a try on my PR3 blog. I just signed up, so well see how it goes. This is a really great project that solves a lot of problems and opens a new options for the blog owners and the writers. People are spending a lots of cash on the autoblogging software and the only thing they get is duplicate articles. Here you can get a fresh new article that meet your blog criteria. I will watch closely how this project will going to develop. Thank you for the comments, we really appreciate it! The issue I have though is giving access. Guest posts I get now are emailed to me. There are currently two and only two people with access, my designer and SEO outsources. None of our staff have access to your blog. The automated distribution system uses it to post content, the data is kept secure and of course you can revoke access any time as we ask you to create a separate user for the network. Seriously though, I get what you’re saying; I didn’t mean to offend anyone, it just gives me the willies is all. I signed up when they first launched, but when I went back to visit my website and had a whole bunch of new categories that didn’t match my existing ones, I quickly revoked the “editor” level access. I think this is one I’m going to take a wait and see approach to. The categories should have been based on your selections during the signup process. If this was not the case please drop a line to our support team. An alternative resource for guest blogging and blog advertising is Linknami.com, where advertisers can find relevant niche blogs and request to publish their articles there for a fee or optionally have the blog owner write an article such as a review for them. 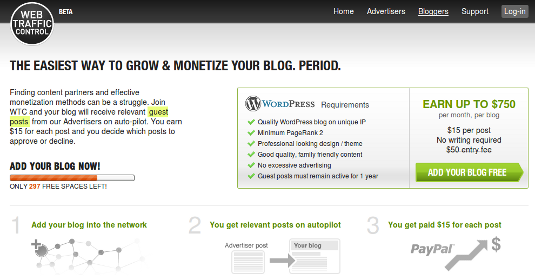 I have been guest blogging at giglogo.com and other blogs for free, I have never heard of paying to guest blog. What is the benefit to guest bloggers? The benefit to guest bloggers is that they get easy and reliable access to a range of targeted, relevant blogs where they can publish quality information with backlinks to their website. The problem with guest blogging in the ‘normal’ manual way is that its difficult to turn this into a scalable strategy because of the time is takes to find suitable blogs, handle the admin, etc. Guest posting is cool but I don’t like too much of it. I want the feel of the blog to be me and not lots of other people. But this does sound good for a muti blog though. I agree Antonio. Blogs like ours would definitely not want to publish that many guest posts per month, but if you had a niche blog that wasn’t your primary blog it might work IF the quality is really good. Don’t forget that you decline as many posts as you want and hand pick the posts that you really want. I like it. It’s just another avenue to generate income through writing online. It’s only helping the industry in my opinion. Interesting, I think as long as it’s proven that it can really generate lots of traffic business will pay for them. But I want to hear more of what others think of this kind of concept. Even sites that kowtow to Google and their every whim and update get slapped. People who kiss up misunderstand a basic tenet of the power hungry: that won’t save you because you are nothing to them. Who died and made them God? How long will people naively believe they are our benevolent providers of goodness and wake up already? There is NO Google Fairy and any site that has no incoming links will never be found. I don’t care how great your site is if no one originally finds it who exactly do you think will be able to link to it if you don’t pro-actively share it somehow? Thanks Gail, I could not have said it better! Really interesting concept. It’ll be interesting to see how it all pans out. As a mom blogger, I had a blog with pagerank and a good subscribership, so I got requests quite frequently from advertisers looking to put content on my site. Some offers I accepted and others I did not – it all depended on whether I thought the content was a good fit for my readership and if I thought it was good quality writing and information. So, I agree that the issue of being an ethical person has a lot more to do with the person’s overall character and not whether they take money to put up a post or not. It all depends on your goals and to many of us blogging is a joy as well as a part of our business/revenue model. I don’t publish the mom blog anymore, but if my new blog qualified (no pr…yet!) I’d surely give this program a whirl. Indeed, this is why we have two layers of moderation, first we review each post, then you get to approve or decline, so that you can ensure there is a good fit for your readership.